Dinner last night was on the Bonaire waterfront at Kariel's overwater restaurant. 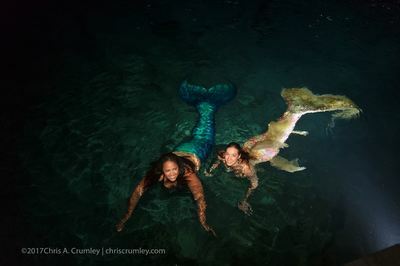 After eating, two mermaids dropped into the water and appeared right below our table. Fortunately, no sharks were feeding on table scraps. Mermaid: Celine Van de Voorde (Brussels, Belgium) -- with Cydney Tolbert and Celine Van de Voorde.